♥ Why is it called Apple? Mouse over this picture to see. It started when I was working in the 80s at ComputerLand. I was hired by my mom’s friend the year after I had graduated high school. She hired me to be her assistant. We sold IBM PCs to banks. There were no hard drives or memory on computers in those days. We saved our data on something called a 5 1/4 inch floppy disc. One beautiful day a cute square box with an apple on it arrived that changed our lives. I got to open it. That was truly an exciting memory. My very first computer purchase ~ the Mac Classic. I walked out of the SJSU Spartan Student Store with this in a box in 1986. It seems like yesterday. It was the 1984 Macintosh also called the Mac Classic. We opened it up and I saw my first mouse. I couldn’t believe it. It was like a dream come true, someone, thank you Steve Jobs, had revolutionized the computer. We had three programs to play with: a version of Word called MacWrite, a graphics program called MacPaint and solitaire. Do any of you guys remember Wordstar? It was pre-word and used on IBM computers. Basically, you had to type a command-U before underlining and a command-U after the words to stop underlining. If you forgot the second command, your entire page would be underscored. That’s nerd humor for you. Here kitty kitty kitty. Click here to see my S.J. picks. I hung out with the technicians. We got to open backs of computers and change mother boards and printer adapters. Fun stuff yet thoroughly educational and enjoyable. One day my friend Keary programmed a tiny musical symphony. Why I love Apple and Mac Computers. In 1986, after working at IBM, I bought my first Mac Classic at the student store at San Jose State University. The price was US$999. It was a bit of a novelty among my friends but me and my roommate got all of our reports done and WE COULD EDIT THEM. 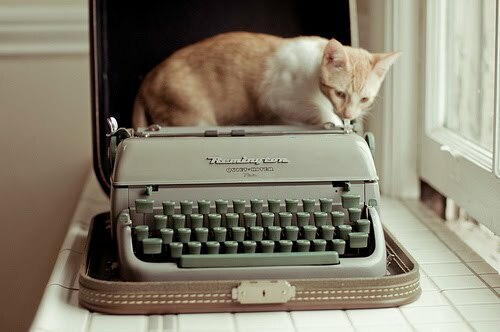 Does anyone remember using white out on paper on a typewriter? For my younger readers: This is what a computer screen looked like before there was a MOUSE! See the Alt? Hold that with the U to start underlining! bwah ha ha ha, nerd humor again! Talk about brand loyalty. The most difficult time in my life is when I moved to Europe in 1995 and couldn’t get support for my Powerbook to get my email going. I survived through it though. Europe has only embraced Apple in the last few years. What I love about Macs? Design. Intelligence. Font choice. The smile when you boot. User friendliness. The cool factor. That I have another mac or Apple and plan on getting more. Thank you Steve Jobs and God bless. How about you? Just how much do you love your Apple products? Are you loyal to any ONE brand? ipad will replace books, in my humble opinion. Also, I’ve never agreed with people who say Mac is just used for designers. I think ANYONE would love a mac product. Also I JUST had a long conversation how the ipad will revolutionize reading. I believe it will. I see kids with backpacks weighing 20 pounds and I get it big time. Thank you for reading and commenting. please feel free to visit our gift store by clicking here.